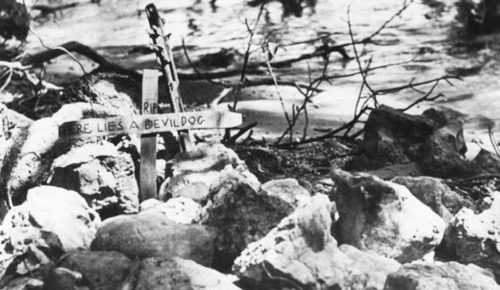 The grave of an unknown Marine, somewhere in the South Pacific. This site is dedicated to the memory of more than three thousand young Americans who gave their lives during the Second World War. They came from every state in the nation, from every conceivable type of home, from colleges and the CCC. Most were in their late teens or early twenties. They fought on land, at sea, and in the air. Every one was a Marine, every one died far from home, and none of them was returned to their loved ones once the war ended. There are many database sites that one can search for names or serial numbers. The goal of this site is to provide a biographical sketch of each Marine. If you find a name you recognize, and can share stories or photographs, please consider contributing! I hope to have a full site with a dedicated URL up and running in the future, but there is an astronomical amount of work still to do. As the seventieth anniversary of the attack on Pearl Harbor approaches, take a moment to read the names and stories listed here, and think where the world would be had young men like these not stood up for what was right. 70th anniversary of the attack on Pearl Harbor.